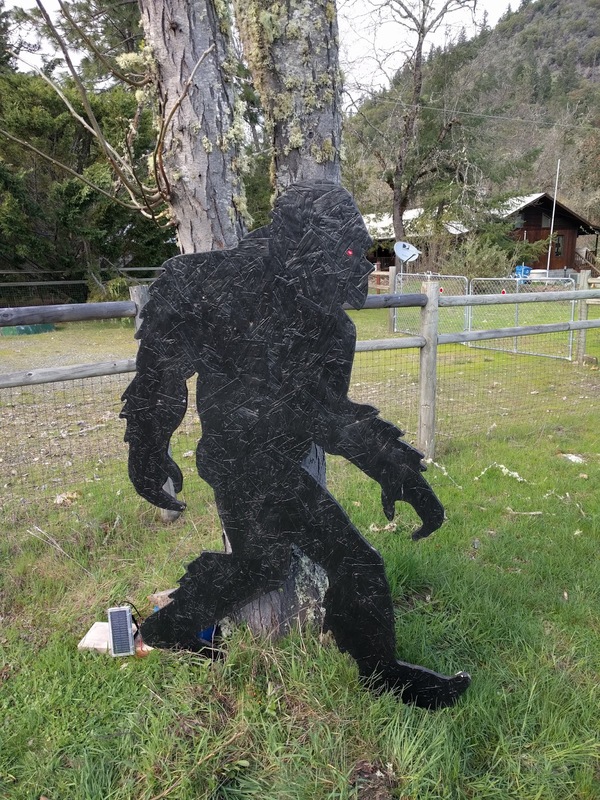 Those who, for some reason, read this blog regularly know that we have a six-foot plywood cutout of "Bigfoot" in our yard. Southern Oregon is Bigfoot country, so we want to do our part. One of the descriptors of Bigfoot is that has "Glowing Red Eyes." Since our cutout is in profile (his good side, natch), we only needed one eye, but we did need one. Originally, when one bought LED's, they came in one color; red, and one illumination mode; continuous. The most common size, called "T-1.75" was and is about 5 mm in diameter. If you wanted an LED to blink, you had to use an external circuit, usually made from a couple of transistors or, later, using an NE-555, a Signetics integrated circuit from 1980 or so that is still in production and being designed into products today. Not many IC's can say that. Eventually, though, manufacturers figured out that they could incorporate a "blink" circuit inside the LED. You just supplied continuous DC power and it blinked. A colleague told me of a job interview he had where the prospective boss pointed to a blinking LED in colleague's radio station and asked "What's the technology behind that?" No doubt, he was expecting to hear that colleague had built an external blinking circuit as described above. Not so: It was just an off-the-shelf blinking LED. Nonetheless, colleague got the job! When it comes to Bigfoot, a steady-burning LED (red, of course) would work as an eye. It's a little boring, though. A blinking LED might be better, but there were problems there, too. Most "Blinker" LED's are the 5 mm (or even 3 mm) diameter ones -- too small to serve as a Bigfoot eye. Fortunately, LED's also come in 10 mm (0.39") diameter, which is much more suitable. They're fairly rare, though, and they don't blink. Within the last few years, fortunately, LED designers have created "Flame" LED's, which flicker in a (pseudo-) random pattern, simulating the flame of a candle. They're often used in middle-level Italian restaurants as rechargeable fake candles to light your meal. To the rescue rides our old pal and Dead Electrical Dude Georg Ohm. His law tells us that a series (daisy-chained) circuit divides the voltage between the loads, but that current is the same for all of them. 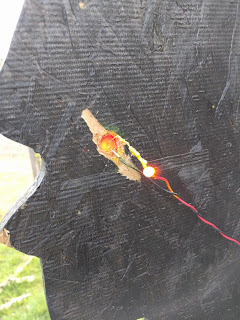 That meant that I could use a 5 mm "Flame" LED in series with a 10 mm red LED to make the big one flicker along with the little one. Living in the woods as he does, Bigfoot could not rely on plug-in electric power. The logical alternative was a small storage battery, recharged in the daytime by a solar panel. Most small solar panels are rated for 5 volts, to use with phone chargers and such, or 12 volts, to operate equipment normally used in vehicles. For my purposes, though, 5 volts was not quite enough, while 12 volts was too much. I could have used 12 volts, but it would have meant just burning up more power in the resistor. While there are several different technologies, most lead-acid storage batteries, like those in cars and (most) airplanes are called "12 Volt" batteries, even though, when fully charged, they're more like "13.8 Volt" batteries. Similarly, most aircraft use a "24 Volt" electrical system, even though they actually run at more like 28 Volts. A "12 Volt" battery has six cells in series, each providing around 2 volts, while a "24 Volt" battery has twelve. Up to the 1950's, most cars used "6 Volt" electrical systems, powered by 3-cell batteries. They did the job, mostly, but had a serious limitation: Work, measured in Watts (named for another Dead Electrical Dude), is the product of voltage and current. Doing a job like running the starter motor on a car takes twice as much current if you only have half as much voltage. 6 Volt systems often needed really fat wires to carry the heavy current needed to run lights, motors and radios. Car makers figured out that they could save money by doubling the voltage of car electrical systems from 6 to 12 Volts, so they did. That's the same reason that most airplanes use 24 Volt systems - because they can use thinner wires than 12 volt ones. That's especially important when designing an airplane, where saving weight is the Holy Grail of design. Fortunately, there are still a few applications where a 6 Volt system is needed (besides Bigfoot eyes). One of them is automated "Game Feeders." They're timer-controlled units that regular dispense, say, deer food so the deer get in the habit of coming by regularly. Then, once hunting season opens, you know when to come and kill them. It doesn't seem very sporting to me. (Actually, most hunting seems pretty unsporting to me). Because they're out in the woods, game feeders are often solar powered, so there are 6 volt solar panels to go with the 6 volt batteries. Those are what I used. Since "Flame" and "Blinker" LED's need a bit more voltage than regular ones, I bread-boarded the circuit to see what value of resistor I needed. It came out to around 30 ohms, for about 10 milliamperes of current through the LED's. is 1/1000 of an amp. Batteries are often sized in "Ampere-Hours." A battery rated at 5 AH can, in theory, supply 5 amps of current for one hour or 1 amp of current for 5 hours before needing to be recharged. (In actuality, batteries are much more efficient at some discharge rates than others, so Amp-hour ratings are stated at only one discharge rate, often 20 hours. Since Bigfoot's eye uses 10 milliamps, (1/100 of an amp), it needs 1 amp-hour of electricity every 100 hours). A small 6 volt lead-acid battery rated at 4.5 amp-hours would keep Bigfoot flickering for 450 hours, almost 19 days. Even in Oregon, we usually get sun more often than that. Solar panels generate power based on their area. Again, there are different technologies used. But, all else equal, panel with twice the area will produce twice as many watts of power. 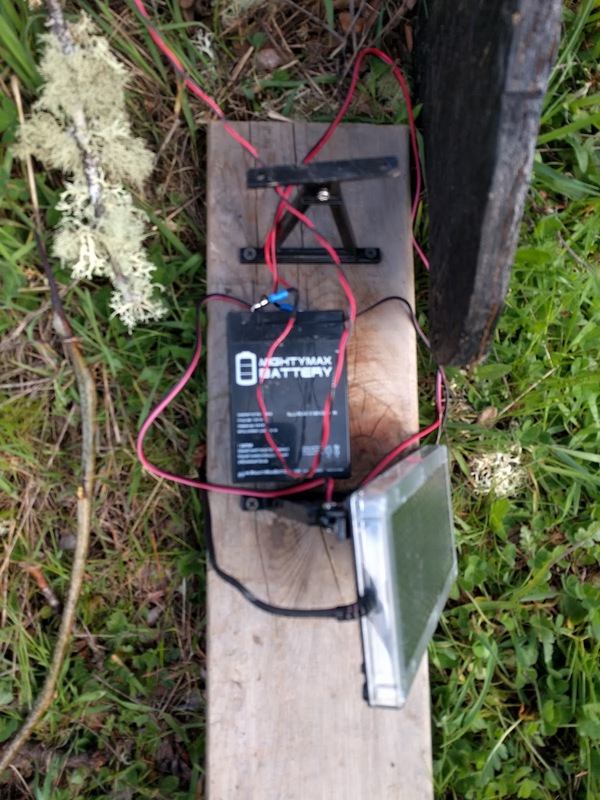 Since most hunters don't care much about electrical engineering, the "Game feeder" 6 volt solar panel didn't come with detailed specifications. Based on my experience, though, I expect it's around 5 watts. Of course, solar panels are rated on bright, cloudless days, so most of the time it wont do that well. As I like to ask, though, "How good does it need to be?" 5 watts in a 6 volt system is about 0.8 ampere (5 divided by 6). If it's, say, half that good, that's 0.4 amperes for perhaps 5 hours a day. Charging a 4.5 amp-hour battery at 0.4 amp means that a full charge takes maybe 15 hours (you have to put back more electricity than you took out of the battery when you charge it). So, each day you get roughly two amp-hours (0.4 amps times 5 hours of daylight) of charge. We know that Bigfoot's eye draws about 0.01 amp of current, so, over 24 hours, he needs 0.24 (about 1/4) amp-hour. If the solar panel delivers almost 2 amp-hours per day (on average), Bigfoot's eye should continue flickering for a long time. In larger systems, one needs a "Charge controller" to prevent overcharging the battery. At this scale, though, we don't, since the overcharging is happening at a pretty low rate. That means it doesn't generate much heat -- the big enemy of lead-acid batteries. Pre-Retrofit A Florescent "Shop Light"